Whether you need assistance to take care of only one piece - or the entire puzzle of your trade show event marketing, you get to choose! We will work with you to tailor our offerings to exactly what you need. 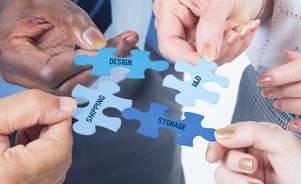 From exhibit design, graphic design, program management and trade show education, we have expertise in it all! Our people have all the skills and experience to handle every detail of your project, no matter the size or scope. Our team can help with everything from the initial design concept, show book forms, shipping coordination, on-site labor, trade show booth installation and dismantling, booth storage and much more. Let us take the reins and be your organizing expert. We will lead you through all the details to success! 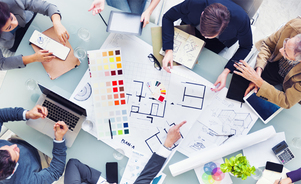 Our expert designers work WITH you, utilizing a collaborative process to prominently portray your company's story in a three-dimensional space. Our designers are skilled in much more than just graphics - taking in consideration lighting, flooring, and how to deliver a unified message of who your brand is to grab people's attention in just a few seconds on the crowded show floor. Our first priority is always keeping your exhibiting goals in mind. Let us be your trade show expert. 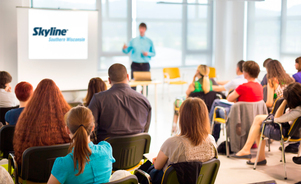 Skyline Southern Wisconsin is proud to offer free live educational seminars, monthly webinars covering a broad range of topics, an array of white papers we have cultivated over the years, and a blog that is continuously updated with helpful tips on every trade show topic you can possibly imagine. If you are looking for trade show knowledge, we've got you covered, one way or another. Don't be afraid to ask - we'll guide you in the right direction! Have a question about one of our services or interested in learning more? Give us a call at (262) 347-3680 or fill out this form - we look forward to hearing from you!